The action was pretty quiet for the week as kids got ready to head back to school keeping parents busy. 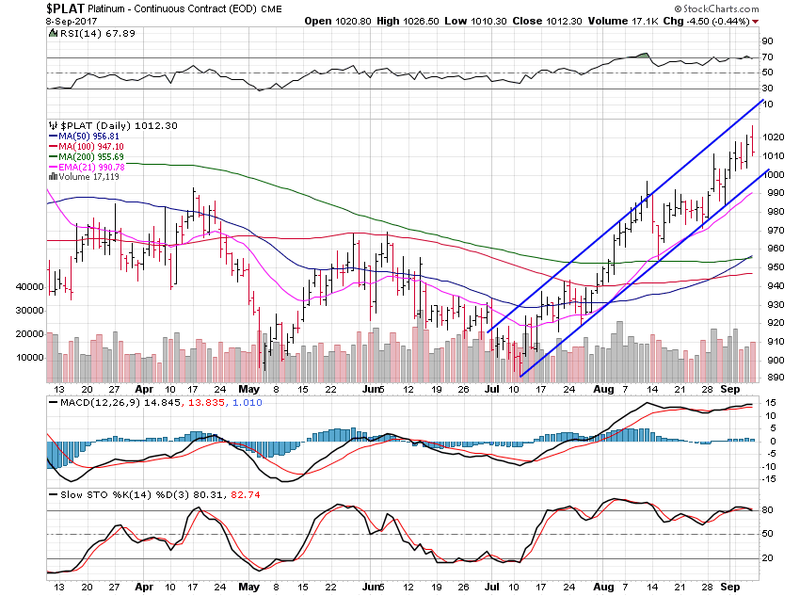 The metals continue to act great along with miners, but they could use a little rest. I’ve been contemplating retirement for some time and now is the time. I’ll still trade, likely even more now, but I am closing down my newsletter business. That means I won’t blog as often or write weekend letters on metals most weeks. With so many newsletter options out there I’m not really willing to put in the massive work needed to make mine standout, I rather focus on trading. I’ll still write when I deem it necessary so please follow me as mentioned above. Just focusing on trading has been my goal since day one, and that day has finally come. I will finish out September but then I will slow down and just focus on trading, which really excites me. Gold continued its strength and gained 1.56% this past week. The nice channel should take gold up to heavier resistance on the weekly chart at $1,395 or so but perhaps a little rest is due. 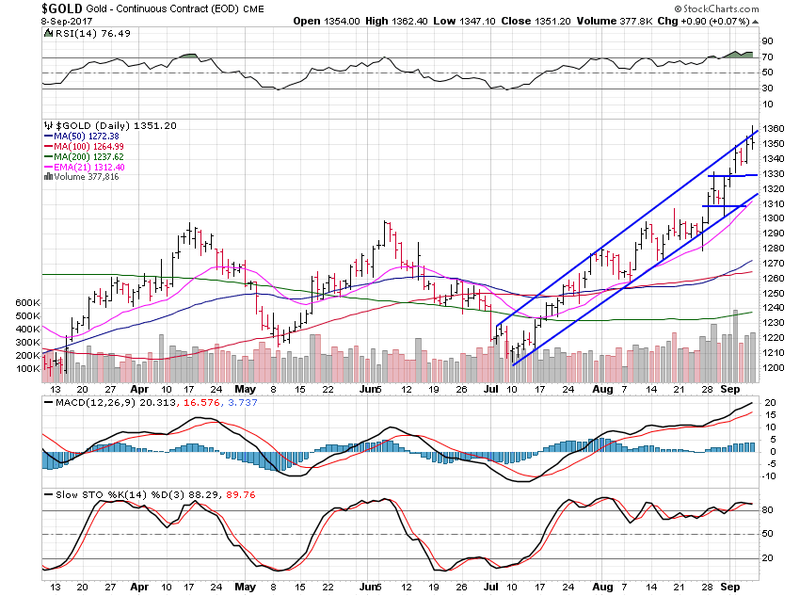 Often times, a move above the channel and back into it is the start of at least a little consolidation period. Great action all in all. Silver rose 1.72% and is acting great as well. 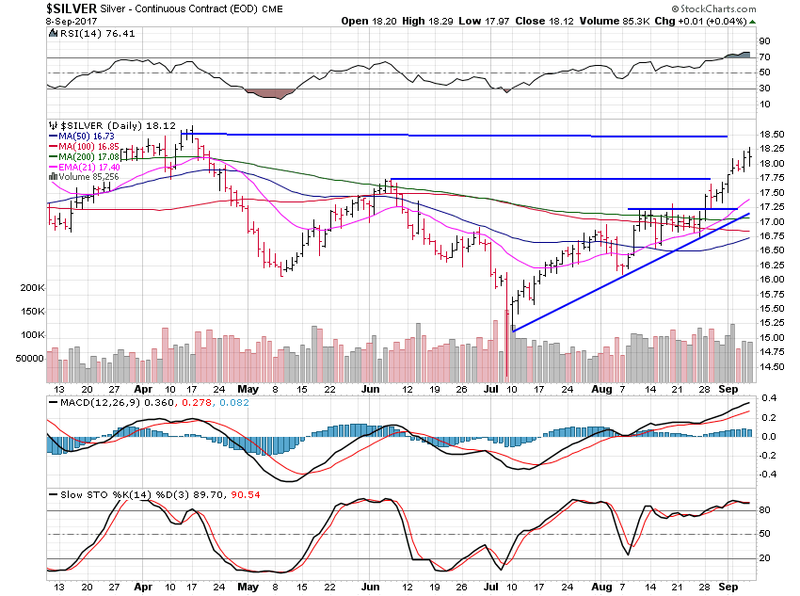 If we see silver move above $18.50 then the next resistance comes way up at $21.30 or so. We’re in the right time of year for precious metals strength so the stars do seem to be aligning. Platinum only notched a 0.33% gain but remains in a nice uptrend. 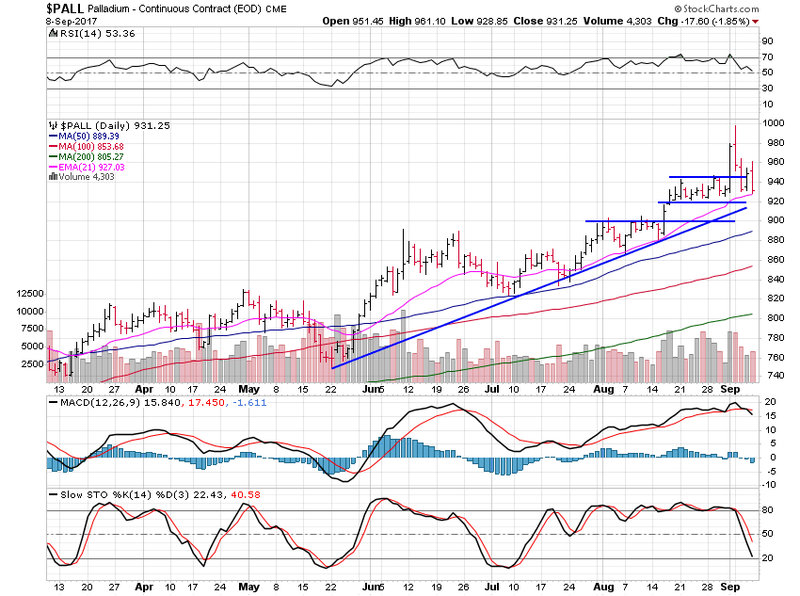 We can see a great example of a channel breakout leading to a consolidation in early August on this chart. Look for that type of move in gold. Platinum should hold the $1,000 area. Palladium lost 4.69% this past week and may be warning us. Palladium has been the leader for some time now and it showing weakness tells me gold and silver may well be in need of a rest as well. Time will tell but I did lock in some solid gains in the miner space this past week. Let’s see if palladium can hold $920, if not, $900 is the next support area to keep an eye on.